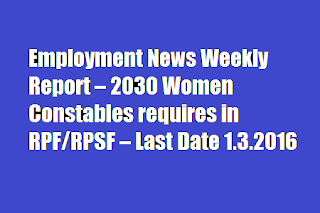 Employment News published an another list of vacancies including 2030 vacancies in South Central Railway. 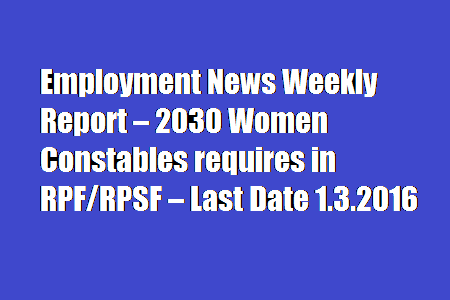 SCR invited applications from women candidates for the posts of Constable in RPF/RPSF. Application from candidates will be accepted through ONLINE MODE only. Applicants are advised to check the official website of South Central Railway or RPF Online Registration website. 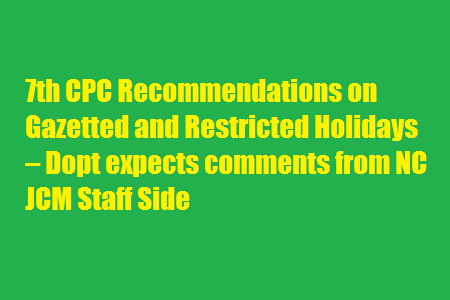 Please find attached the extracts of para-9.2.19 on the above Report on Gazetted and Restricted Holidays. The Commission has expressed opinion that the present system is working well and has recommended status-quo. 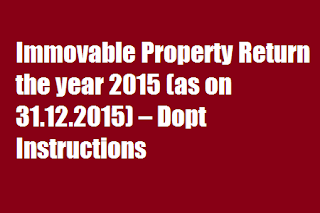 The undersigned is directed to refer to this Department’s Office Memorandums of even number dated 21.12.2015 and 18.01.2016 on the subject cited above (available at persmin.nic.in -> DOPT -> Central Secretairat -> CSS -> Property Return). 2. 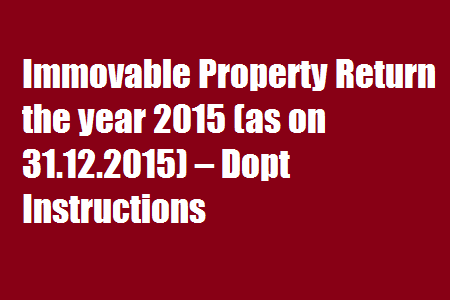 A large number of CSS Officers have not yet submitted the Immovable Property Return for the year 2015 on 31.12.2015). As already informed, IPR should be submitted by all CSS officers through the Web Based Cadre Management System which is hosted at cscms.nic.in. However, as large number of officers are accessing the system, it has become slow making it difficult to submit the return online. As the system is web based, officers may try filing IPR beyond office hours when the system is less congested. If it is still not possible to file the return online for any reason, they should file the return in paper format to their offices by the stipulated date i.e. 31.01.2016. They may subsequently file the same through cscms.nic.in. 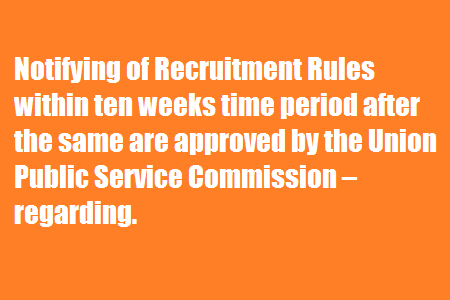 Notifying of Recruitment Rules within ten weeks time period after the same are approved by the Union Public Service Commission – regarding. Attention is invited to Para No. 5.2 of this Department’s O.M. No.AB.14017/48/2010-Estt. (RR) dated 31st December, 2010 on framing/amendment/relaxation of Recruitment Rules wherein it has been stipulated that the Recruitment Rules or amendment(s) thereto as finally approved by the Union Public Service Commission are required to be notified within a period of 10 weeks from the date of receipt of their advice letter. This time limit should be strictly adhered to. 2. 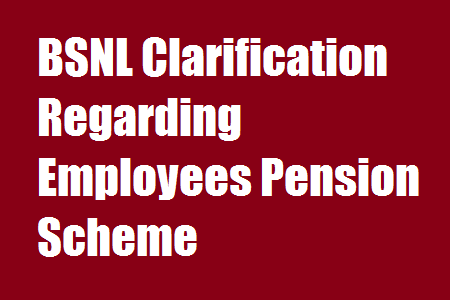 The Commission has, however, brought to the notice of this Department that even after the lapse of 10 weeks time, the Recruitment Rules pertaining to a number of posts which were advised upon by the Commission are yet to be notified. 3. 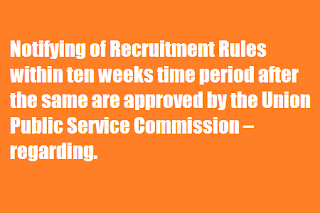 Ministries/Departments are, therefore, requested to initiate action for notifying the Recruitment Rules as soon as the same are approved by the Commission so that the prescribed time limit of 10 weeks is adhered to. Payment of Dearness Allowance to AIS officers. Subject:- Payment of Dearness Allowance to AIS officers. In order to facilitate calculation of leave salary and gratuity of an AIS officer at the admissible rates of Dearness Allowance, it is hereby ordered, that salary for the month in which he/she reaches the age of superannuation, shall be drawn at such rate of Dearness Allowance as would be applicable to Central Government employees on that date. (1) The hospital shall be bound not to charge, from the State Government employees, more than the rates as may be fixed by the State Government from time to time for approved private hospitals for various treatments, investigations and implants. 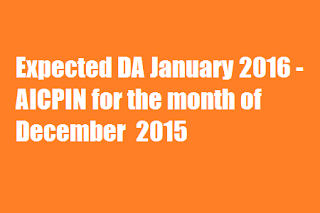 (2) The Order will be effective upto 5 years from the date of issue. Upgradation of pay has been sought for the group of posts in the present pay scale with GP 2800 to GP 4200. These include Junior Court Assistant, Chauffer, Special Process Server, Restorer Gr. I /Library Attendant Gr. I/Gestetner Operator Gr. I. 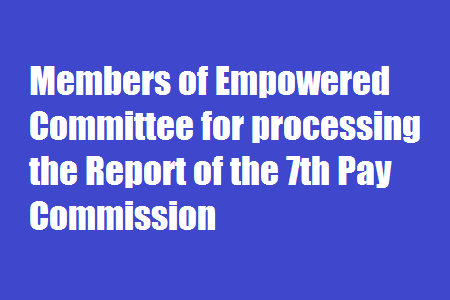 Analysis and Recommendations : The Commission has noted the recommendations made by the Committee of Judges in this regard. The Committee of Judges after examination of demands made has pointed out that in view of basic qualification, nature of duties and degree of efficiency, integrity and confidentiality the post of Junior Court Assistant can be considered for an upgradation in pay. The Commission further notes that the educational qualifications for direct recruitment to the post of Junior Court Assistant is a degree from a recognised University and knowledge of computer operations with a stipulated typing speed in computers. The information furnished to the Commission with respect to the Recruitment Rules of various posts also indicates that in all other posts carrying a GP 2800 the educational qualifications is lower than graduation and therefore equating Junior Court Assistants with these posts would not be correct. In view of the foregoing the Commission is in agreement with the views of the Committee of Judges. 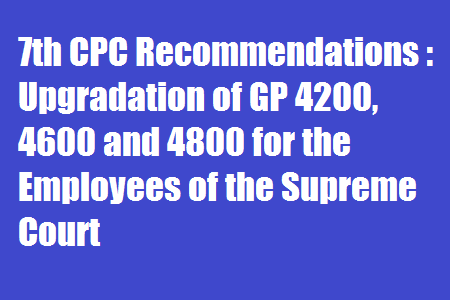 Accordingly, the Commission recommends upgradation in the pay for the post of Junior Court Assistant to GP 4200 from the existing GP 2800. For the group of posts covering Court Assistant, Personal Assistant, Accountant, Cashier, the Association requested pay parity with the holders of analogous/equivalent posts in the High Court of Delhi, who are drawing pay with GP 4600. Analysis and Recommendations : The Commission has noted the recommendations made by the Committee of Judges in this regard. The Committee of Judges, after examination of demands made, agrees with the recommendation of upgradation in pay to conform to the pay of the holders of analogous posts in the High Court of Delhi. The Commission recognises that the Supreme Court is at the apex of the hierarchy of Courts in India and hence its personnel should not be disadvantageously placed vis-à-vis the High Court of Delhi. 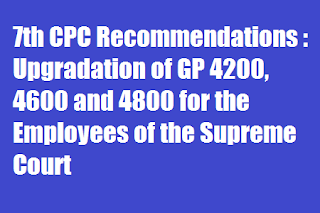 Accordingly, the Commission recommends upgradation for the post of Court Assistant, Personal Assistant, Accountant and Cashier to GP 4600 from the existing GP 4200. Upgradation of pay has been sought for pay of the group of posts in the present GP 4600 to GP 4800. 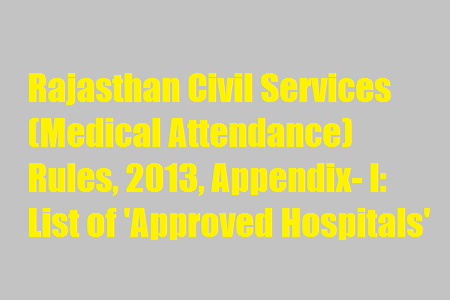 These include posts of Private Secretary to Additional Registrar, Sr. Personal Assistant, Senior Court Assistant, Court Associate, Editor of Paper books, Assistant Librarian, Proof Reader, Assistant Accounts Officer (Concurrent Audit) and Building Supervisor. The justification for upgradation is that the holders of analogous posts in the High Court of Delhi are in GP 4800. 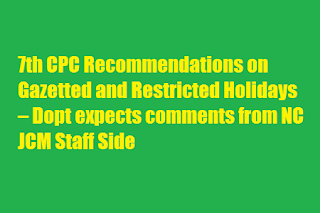 Analysis and Recommendations : The Commission has been informed that the Committee of Judges, after examination of demands made, have endorsed the upgradation in pay to conform with the pay of the holders of analogous posts in the High Court of Delhi. The Commission recognises that the Supreme Court is at the apex of the hierarchy of Courts in India and hence its personnel should not be disadvantageously placed vis-à-vis the High Court of Delhi. 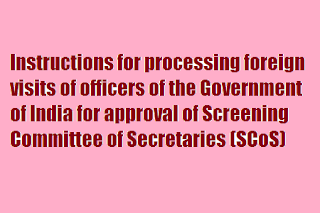 Accordingly, the Commission recommends upgradation in the pay for the post of Private Secretary to Additional Registrar, Sr. Personal Assistant, Senior Court Assistant, Court Associate, Editor of Paper Books, Assistant Librarian, Proof Reader, Assistant Accounts Officer (Concurrent Audit) and Building Supervisor to GP 4800 from the existing GP 4600. However on completion of four years approved service further non-functional upgrade to GP 5400 (PB-2) is also recommended for these posts. 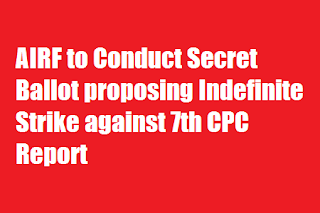 All-India Railwaymen’s Federation (AIRF) threatened to go ‘Indefinite Strike’ against the Seventh Pay Commission report. “We will conduct a secret ballot on February 11 and 12 to decide the date and future course of action (on strike),” AIRF General Secretary Shiv Gopal Mishra said here today. He said if railway employees will cast their votes in favour of launching indefinite strike then we will go for it and accordingly a date would be announced. Mishra said their demands also include review of new pension scheme and filling up of large number of vacant posts in the railways. According to the Seventh Pay Commission recommendations, there would be an additional burden of Rs 32,000 crore on railways and Railway Minister Suresh Prabhu has described it as “unbearable”. Mishra also said, there were about 2.5 lakh posts including those of loco pilots, assistant station masters and track men lying vacant in railways. In order to make the proposed agitation a success, Mishra said a sustained awareness campaign will be launched from January 25 to February 10. 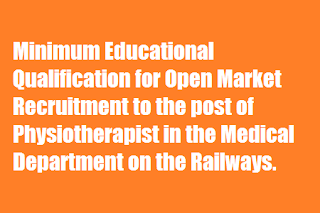 Sub: Minimum educational qualification for open market recruitment to the post of Physiotherapist in the Medical Department on the railways. Ref: Letter No. E(NG)II/2001/RR-1/45 dated 22/5/2015 (RBE No. 49/2015). 2. The revision of qualification for the above category of post has been under consideration of this Ministry pursuant the issue raised by National Federation of Indian Railwaymen (NFIR) in the PNM meeting with Railway Board. 4. These instructions will be applicable from the date of issue. Wherever recruitment process for the post has been notified and date of acceptance of application is yet to be closed, suitable corrigendum be issued by the concerned recruiting agency. The brewing discontent amongst the central government employees is threatening to create a storm and disrupt the implementation process. The unions are asking around 44% hike on the basic minimum pay and review the salaries every 5 years. 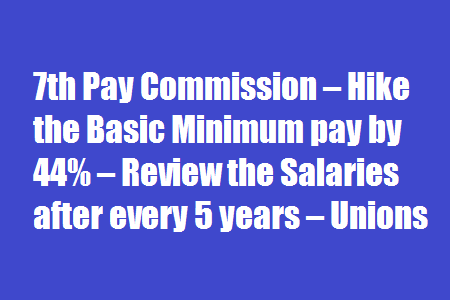 7th Pay Commission – Hike the Basic Minimum pay by 44% – The unions had staged a 3-day agitation earlier in January, and even threatened to strike work for longer period. 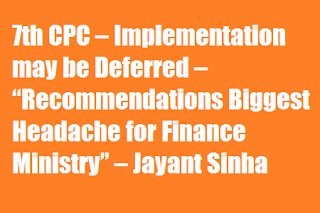 Implementing the recommendations of the 7th Central Pay Commission (7th CPC) is not going to be a cakewalk for the government. The brewing discontent amongst the central government employees is threatening to create a storm and disrupt the implementation process. 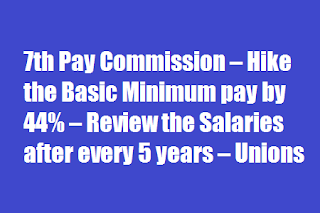 The unions are asking around 44 percent hike on the basic minimum pay suggested by the 7th Central Pay Commission. The 7th CPC had recommended the minimum pay at Rs 18,000 and the maximum pay at Rs 250,000, but the employee unions wants the minimum pay to be hikes from Rs 18,000 per month to Rs 26,000–a rise of around 44.4 percent. The unions also said that the pay panel has recommended the lowest hike in basic pay since independence. The unions argue that pay scales vary from states to states. They also want the minimum pay to be applied across all the states in the country. The Central government employees’ unions have not only demanded to increase the minimum pay of central government employees, but also want government to review the salaries of central government employees after every 5 years instead of the current 10 years. The previous 6th Central Pay Commission had recommended a 20 percent hike, which the government had doubled while implementing it in 2008. 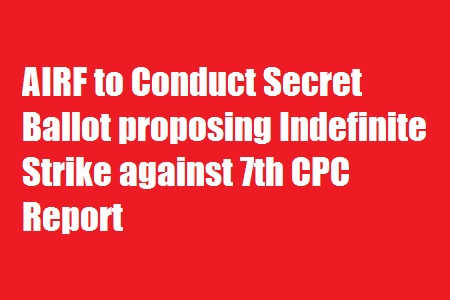 However, the present government is on the look out for a way to somehow influence negatively, the already employee negative 7th cpc recommendations. The unions have upped the ante on salary hike since the government set up empowered committee of secretaries headed by Cabinet Secretary earlier in January to process the recommendations of the 7th CPC. The unions had staged a 3-day agitation earlier in January, and even threatened to strike work for longer period. 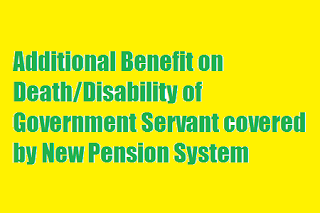 Additional benefit on death/disability of Government servant covered by New Pension System — clarification regarding. New Delhi, Dated: 13 .01.2016. Please refer to the instructions issued vide Board’s letters No. 2008/AC-II/21/19, dated 29.05.2009 , No. 2010/AC-II/21/18 dated 02.07.2013 and letter of even number dated 08.09.2014 on the above mentioned subject. 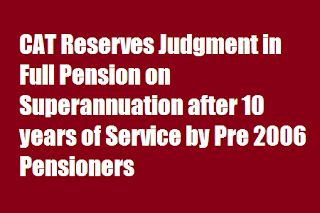 Retirement fund body EPFO may provide 9 per cent interest on PF deposits for this fiscal, which is higher compared to 8.75 per cent provided in previous two fiscals to its over five crore subscribers. “The income projection of Rs 34,844.42 crore for the current fiscal is expected to be revised upward. 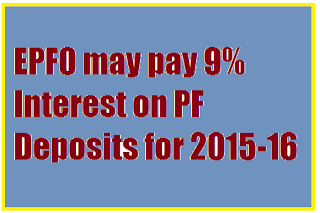 Thus the body can provide 9 per cent rate of interest on PF deposits for 2015-16,” an EPFO trustee and Bharatiya Mazdoor Sangh Secretary P J Banasure told PTI. 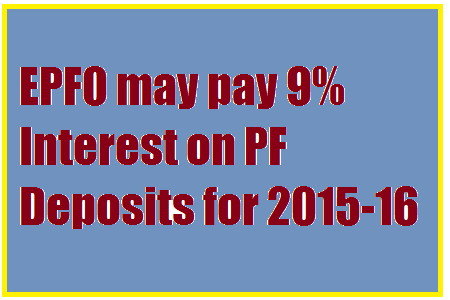 The Employees Provident Fund Organisation’s (EPFO) Finance Audit and Investment committee (FAIC) recommended 8.95 per cent interest on PF deposits for the current fiscal in its meeting earlier this week. According to EPFO income projections worked out in September, providing 9 per cent interest on PF will result in a deficit of Rs 100 crore. “We are expecting that there will be a surplus of Rs 100 crore on providing 9 per cent rate of interest on PF deposits when EPFO will work out the latest estimates. FAIC can change its recommendation in the next meeting and suggest 9 per cent interest rate for 2015-16,” he said. 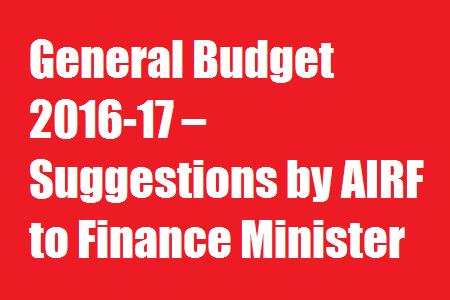 The proposal has to be endorsed by the Central Board of Trustees (CBT) before the Finance Ministry notifies it. However, there has been indications from the Finance Ministry that it will slash interest rate on small savings like public provident fund in view of the rate cut by Reserve Bank of India. With a massive financial resource crunch estimated for 2016-17, the government is planning to defer the implementation of the 7th Pay Commission award. 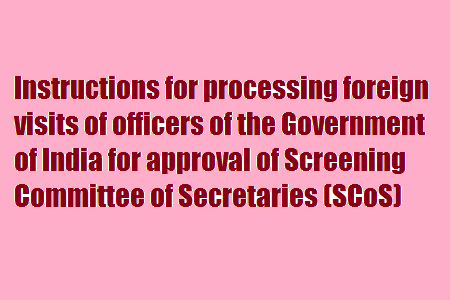 Last week, the Union Cabinet approved the formation of an empowered committee of secretaries to work out ways for staggering the award through more than one financial year, instead of letting the Rs 1,02,100-crore bill from the implementation of the award come up at one go. A top-ranked official said one of the options for the empowered committee was to defer the increase in allowances for central government employees, while letting the rise in pay for all scales to go through. According to finance ministry figures, the ratio of allowances to pay for these 4.7 million employees is 1:1.4. For instance, the Budget estimates in 2015-16 pegged the salary bill for all central government employees at Rs 60,731 crore, whereas the tab for allowances is Rs 84,437.4 crore. The step would allow Finance Minister Arun Jaitley to keep the Budget numbers for this financial year and the next close to the targeted 3.9 per cent and 3.5 per cent of gross domestic product (GDP) that he has committed himself to. 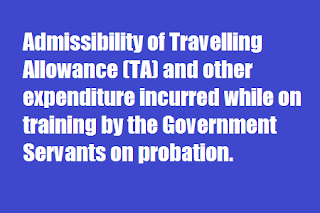 For instance, even if the annual expenditure for 2016-17 were kept at about Rs 18 lakh crore (almost unchanged from Rs 17,77,477 crore in 2015-16), the Pay Commission recommendations would add another 5.5 per cent to it. Given the sluggish pace of GDP growth and the almost negative deflator, the aggregate Budget numbers would otherwise be impossible to sustain on the back of the current trend in growth of tax receipts - just 50 per cent of the Budget estimates after the first eight months of the year, according to Controller General of Accounts data. The assumptions being worked on in North Block are that these might not change dramatically in the next financial year, too. 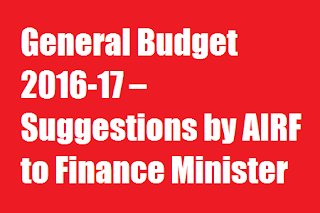 The announcement of a deferral is expected to be part of Jaitley's Budget speech on February 29. 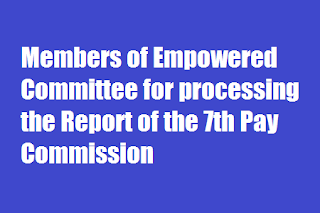 The formation of an empowered committee for the pay panel recommendations, again a first for the central government, is meant to bring all stakeholders on board in the exercise. The status quo on allowances would also allow the government to ignore the demand made by various staff associations to raise the minimum level of salary for employees. The Pay Commission has suggested that the minimum should be Rs 18,000 per month; the unions have demanded that it should be raised to a band of Rs 19,000 to Rs 21,000 a month. Such a change would have created a ripple effect. About 70 per cent of the government employees are bunched in the non-executive ranks; the starting salary for them tops about Rs 42,000 a month, show calculations by the Commission. Even a modest increase in pay for them would cascade the bill for the government by another Rs 50,000 crore annually. The award of the Commission is slated to take effect from January 1 this year. A key element in the plan to defer some elements of the 7th Pay Commission recommendations will be the railway ministry. Government managers reckon the powerful unions of the Indian Railways need to be brought on board for this plan to be successful. The higher wage bill for the Suresh Prabhu-led ministry works out to Rs 28,450 crore a year, only a shade less than the yearly loss it makes on its passenger services at present. No formal communications have been sent out to the railway unions by the committee. "It will follow once the empowered committee has decided to take a call on which allowances to clip," said the official. 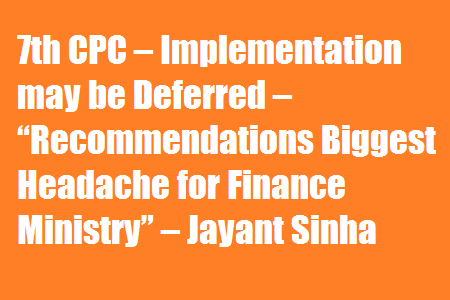 In a recent television interview, Minister of State for Finance Jayant Sinha had said the Pay Commission recommendations were the biggest headache for his ministry, struggling to keep the aggregate expenditure of the Union government under control. Admissibility of Travelling Allowance (TA) and other expenditure incurred while on training by the Government Servants on probation. Implementation of “Own Your House Scheme” for the Railwaymen – Indian Railways is employing more than 13 lakh employees who work round-the-clock in all weathers throughout the year. Only a marginal number of railway staff is provided with railway quarters while others have to starve badly for residential accommodation or are forced to reside as tenant. Former Hon’ble Minister for Railways, considering this apathy of the railwaymen, had made announcement in the Rail Budget regarding “Own Your House Scheme”, which has not seen light of the day due to paucity of funds. AIRF, therefore, urges that, necessary funds be allotted for this purpose, which will not only help in providing accommodation to needy railwaymen, but also in rapid growth in construction industry and boost the GDP of the country. 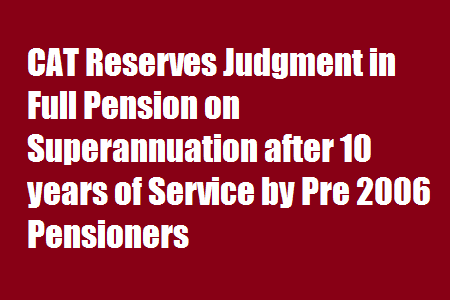 Refund of Pension Charges born by the Indian Railways – Indian Railways is the only government organization which takes care of entire Pension/Family Pension and Retirement benefits to the Railway employees, whereas for the whole lot of government employees, Government of India owns responsibility. 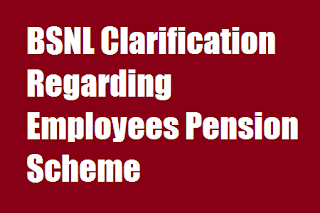 At present, Indian Railways is disbursing around Rs.28,000 in the form of retirement benefits, including Pension/Family Pension to their employees and their dependents. It would be appreciated, if this money should be refunded to Indian Railways to improve economic health, and by this way there will be at least some provision for improvement in the safety standard and passenger care of the Indian Railways. 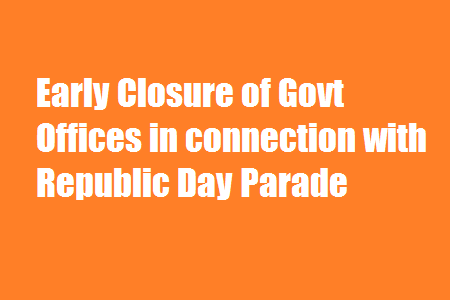 In connection with arrangements for the Republic Day Parade and Beating Retreat Ceremony, 2016, it has been decided that the Government offices located in the buildings indicated in Annexure-A would be closed on 23.1.2016 ( Saturday) at 1300 hours and at 13:00 hours on 25th January, 2016 (Monday). Buildings indicated in Annexure-B would be closed for at Home function on 26.1.2016 till 1930 hours. Buildings indicated in Annexure-C would be closed on 29.1.2016 at 12:00 Noon and Buildings indicated in Annexure —D would be closed on 28.1.2016 at 1600 hours till 1930 hours for Beating Retreat Ceremony. 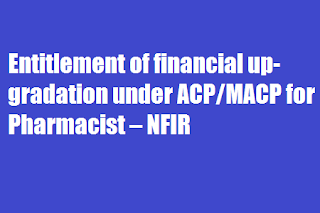 Sub:Entitlement of financial up-gradation under ACP/MACP Schemes – Pharmacist category-reg. 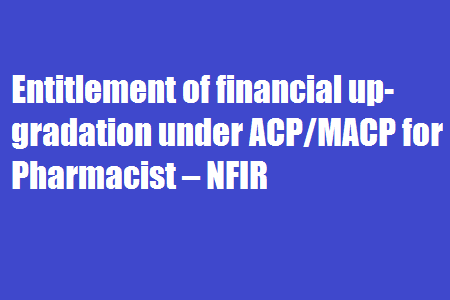 In this connection, Federation cites below the cases of the following Pharmacists working in the Railway Hospitals of Northern Railway, which are required to be reviewed for extending benefit on the basis of above clarifications of DoP&T.